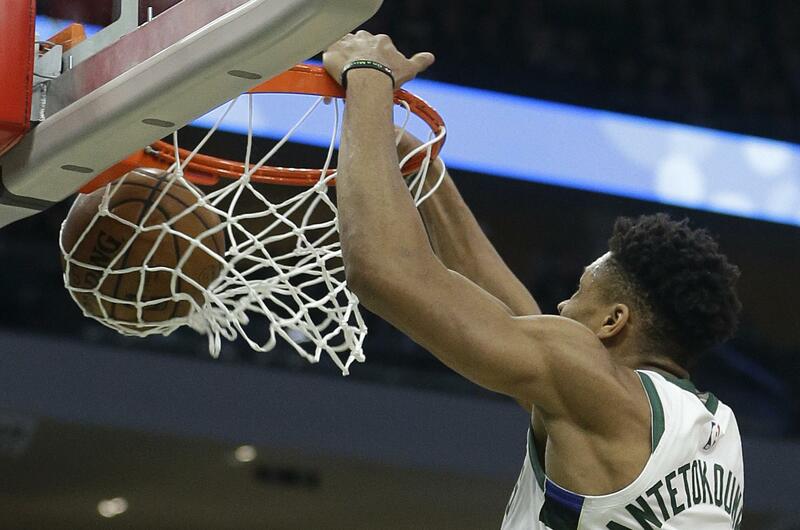 Giannis Antetokounmpo had 24 points and 17 rebounds in just 24 minutes, and the top-seeded Milwaukee Bucks showed they were serious about making a playoff run with a 121-86 rout of the Detroit Pistons in Game 1 on Sunday night in Milwaukee. ROCKETS 122, JAZZ 90: James Harden had 29 points and 10 assists to help Houston rout Utah in the opener of a best-of-five first-round playoff series. Houston’s starting lineup helped carry the scoring load, with each starter scoring at least 10 points. Eric Gordon had 17, Clint Capela scored 16, Chris Paul added 14 and P.J. Tucker had 11. TRAIL BLAZERS 104, THUNDER 99: Damian Lillard scored 30 points and third-seeded Portland opened its playoff series against No. 6 Oklahoma City with a victory in Portland. CELTICS 84, PACERS 74: Kyrie Irving and Marcus Morris each scored 20 points, and Boston rallied in the second half to beat visiting Indiana in Game 1 of their first-round playoff series. Published: April 14, 2019, 8:26 p.m. Updated: April 14, 2019, 9:21 p.m.